Dixie is our precious English bulldog. She is a native of Ethridge, TN and is on duty in the shop every weekday. Dixie enjoys long naps, back rubs, squeaky toys, and soft serve vanilla ice cream. 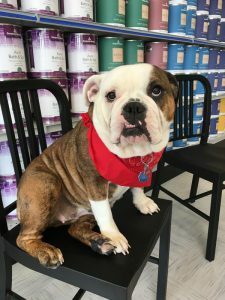 In addition to guarding the cash register at Sweetwater Paint & Supply Company, Dixie is an experienced saleslady and is ready to help with your color selections. Stop in to meet and consult with Dixie. Your canine family members are always welcome in our shop. No rodents or reptiles, please.